This report by Ken Adams is part of a series for CBSNews.com about his run at the 2006 World Series of Poker. At noon the $1500 No Limit Hold'em event got under way. Unfortunately, through a combination of poor decision making and bad luck I busted out mid-afternoon. My flight was not until 11:30 pm, so I went over to the hotel and checked out. I then settled in at the satellite tables to try to redeem myself before going home. The first one I played cost $275. I had stayed away from the lower buy-in single table satellites for the most part, as the small number of starting chips plus the short rounds make it more of a crapshoot than the higher buy-in satellites. The $525 and $1030 satellites do not become crapshoots until the end when the blinds get very high relative to the number of chips you have — at that point it becomes an all-in contest between the final two or three players for who can make the best hand. But with the tournament still under way and most of the better players still in action, the satellite line was mostly for the small buy-in events. While the cheaper single table satellites turn as much on luck as skill because of the structure, the good news is that the skill level of the players is so much lower it often compensates for the increased role of luck. That was certainly my experience in this particular table. Most of the players were passive and straightforward. When they bet they had a good hand; when they didn't have a good hand they checked and folded. It was easy to steal a lot of pots after the flop, regardless of what I held. And if they had any piece of the flop they called all the way to the river, even when they should have known they were beaten. The cards cooperated, and when it got down to me and one other player, we chopped the money in accordance with our chip counts. I had about 75% of the chips, so I took $1,875. I also won a $400 last longer bet, so it was a profitable table for me. This was the first event in which I used my grandson's miniature jade turtle as a card protector. It worked so well I decided to give it another try in a $525 satallite. The field was stronger than usual for a $525 table, more like the fields that are common in the $1030 games. As a small partial hedge I made a $100 last longer bet with the player on my right, one of the few at the table I did not recognize. 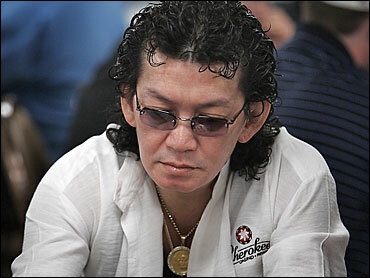 One of the toughest players at the table was Willie Tan, a 50-something Asian-American who holds one World Series bracelet and is a tournament veteran of many years. I was not sorry when he was the first to bust out. Eventually we got down to four players, and I got lucky on the river (instead of being the victim of the river card for a change) to bust the fourth player. I had the J-8 of diamonds. He had the J-7 of clubs. The flop came with J-7-2. I thought I was in the lead and bet aggressively. When a 3 came on the turn, I bet and he raised all in. I was not at all confident at that point, but the pot odds dictated a call. Luckily for me I caught an 8 on the river to overtake his two pair. We were down to three players at that point, but the biggest stack was the player on my right with whom I had made the last longer bet. Unfortunately the turtle's magic ran out a few hands too soon. I was the next one out, and the two remaining players chopped the money. I had time for one last satellite before leaving for the airport. I put my name on the list, and when they called the names for a $525 table I took a seat. On my left was Dan Alspach, he of the matching floral shirt and visor. While Dan is a tough, tricky opponent, he is fun to play with. I wasn't thrilled to have him on my left however. On my immediate right was James Woods, the movie actor. He is a first rate hold'em player, and has done very well on the tournament circuit in the past year or two. I had not played with him before, but he turned out to be very open and friendly. So it was a fun group. I was fortunate to catch some hands, and after three hours it came down to me and "Jimmy" as he urged me to call him. I really wanted to play it out, as I enjoy heads up play and do not get to practice that often against live opponents. I suggested we chop up most of the money, hold back $1,000 and play it out. Apologetically, Woods asked me to chop the whole thing as his brother had been waiting patiently to go to dinner and by now it was after 9:00. So I collected $2,185 and headed for the hotel to collect my luggage and a grab taxi to the airport. I flew home with $2,650 more than I had started with. Viewed another way I invested about $25,000 in buy-ins and won about $27,600 for a profit in excess of 10 percent (before expenses). Not a big score, but I preserved my capital and won enough to more than offset the expenses incurred. With luck, I will score big in the championship event when I return to the Rio for the last chapter in this year's World Series adventure.